Why Do Radio Signals Travel Farther at Night than in the Day? Matt T. asks: I was in southern California a while back and managed to pick up an AM radio station from Washington, but only at night. I’ve experienced the same thing at night in Washington picking up an L.A. radio station. In the day, it doesn’t work. So my question to you is why do radio signals seem to travel further at night than in the day? Not all radio waves travel farther at night than during the day, but some, short and medium wave, which AM radio signals fall under, definitely can given the right conditions. The main reason this is the case has to do with the signal interacting with a particular layer of the atmosphere known as the ionosphere, and how this interaction changes from the nighttime to the daytime. The ionosphere is a layer of the upper atmosphere about 50 to 600 miles above sea level. It gets its name because it is ionized consistently by solar and cosmic radiation. In very simple terms, X-ray, ultraviolet, and shorter wavelengths of radiation given off by the Sun (and from other cosmic sources) release electrons in this layer of the atmosphere when these particular photons are absorbed by molecules. Because the density of molecules and atoms is quite low in the ionosphere (particularly in the upper layers), it allows free electrons to exist in this way for a short period of time before ultimately recombining. Lower in the atmosphere, where the density of molecules is greater, this recombination happens much faster. What does this have to do with radio waves? Without interference, radio waves travel in a straight line from the broadcast source, ultimately hitting the ionosphere. What happens after is dependent on a variety of factors, notable among them being the frequency of the waves and the density of the free electrons. For AM waves, given the right conditions, they will essentially bounce back and forth between the ground and the ionosphere, propagating the signal farther and farther. So clearly the ionosphere can potentially play an important part in the terrestrial radio process. But it is the constantly shifting nature of the ionosphere that makes things really interesting. And for that, we’ll have to get a little more technical, though we’ll at the least spare you the math, and we’ll leave out a little of the complexity in an effort to not go full textbook on you. In any event, the ionosphere’s composition changes most drastically at night, primarily because, of course, the Sun goes missing for a bit. 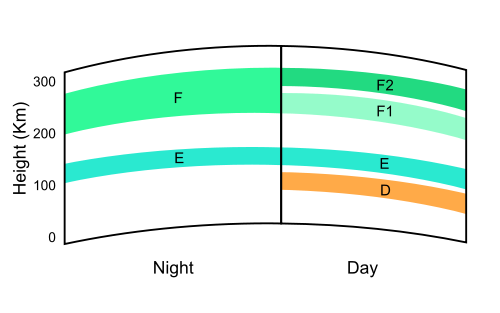 Without as abundant a source of ionizing rays, the D and E levels (pictured right) of the ionosphere cease to be very ionized, but the F region (particularly F2) still remains quite ionized. Further, because the atmosphere is significantly less dense here then the E and D regions, it results in more free electrons (the density of which is key here). When these electrons encounter a strong AM radio wave, they can potentially oscillate at the frequency of the wave, taking some of the energy from the radio wave in the process. With enough of them, as can happen in the F layer, (when the density of encountered electrons is sufficient relative to the specific signal frequency), and assuming they don’t just recombine with some ion (which is much more likely in the E and D layers in the daytime), this can very effectively refract the signal back down to Earth at sufficient strength to be picked up on your radio. Depending on conditions, this process can potentially repeat several times with the signal bouncing down to the ground and back up. 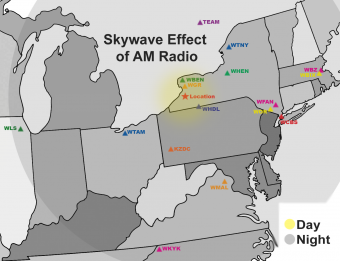 Thus, using this skywave, rather than just the normal daytime groundwave, AM radio signals can be propagated even thousands of miles. Of course, this can become a major problem given that there are only a little over 100 allowed AM radio frequencies (restricted to keep signals interfering too much with one another), but around 5,000 AM radio stations in the United States alone. Given that at night, the signals from these stations can travel vast distances, this is just a recipe for stations interfering with one another. 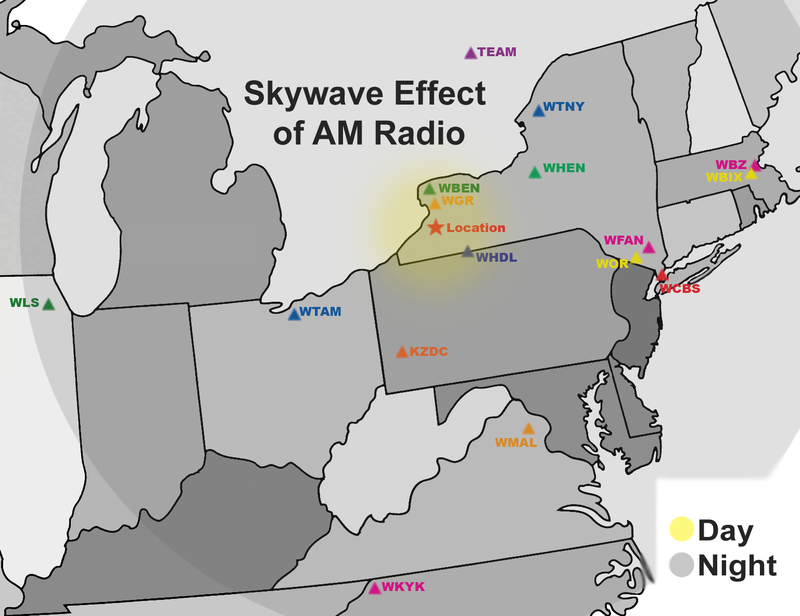 As a result, at night, AM stations in the United States typically reduce their power, go off the air completely until sunrise the next day, and/or possibly are required to use directional antennas, so their specific signal doesn’t interfere with other stations on the same frequency. On the other hand, FM stations don’t have to do any of this as the ionosphere doesn’t greatly affect their signals, which has the side benefit (or disadvantage, depending on your point of view) of severely limiting the range of the FM signals, which rely on groundwave propagation. AM Radio (Amplitude Modulation) was the first type of radio broadcasting used for mass-consumption by the public and is still widely used today. (Although AM radio is becoming less widespread in America, it is still the dominant type of terrestrial radio broadcasting in some countries, like Australia and Japan.) This type of signal works with the receiver translating and amplifying amplitude changes in a wave at a particular frequency into the sounds you hear coming from your speakers. FM Radio (Frequency Modulation), which started coming into its own in the 1950s, is broadcast in much the same way that AM is, but the receiver processes changes in the frequency of a wave, as opposed to the amplitude. What you’ve described is mainly for medium waves that use directional built in antennas,short waves on the other hand intrinsically work thru ionosphere and have missing intervals but they always travel large distances.There is a third type of am signal called long wave but that is reserved for sea faring vessels and requires large antennas and travels close to surface. So the signals don’t bounce off the clouds, which hang lower at night?